File consists of one volume of the Dalhousie University Faculty of Law yearbook Amicus Curia for the year1988. File consists of one volume of the Dalhousie University Faculty of Law yearbook Amicus Curia for the year 1989. File consists of one volume of the Dalhousie University Faculty of Law yearbook Amicus Curia for the year 1990. File consists of one volume of the Dalhousie University Faculty of Law yearbook Amicus Curia for the year 1992. File consists of one volume of the Dalhousie University Faculty of Law yearbook Amicus Curia for the year 1993. File consists of one volume of the Dalhousie University Faculty of Law yearbook Amicus Curia covering the years 1997 and 1998. File consists of one volume of the Dalhousie University Faculty of Law yearbook Amicus Curia covering the years 1999 and 2000. 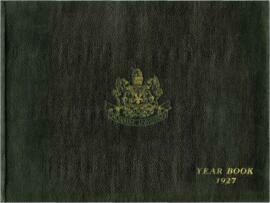 File consists of the yearbook Artifacts:Technical University of Nova Scotia (TUNS) for the year 1988. File consists of the yearbook Artifacts:Technical University of Nova Scotia (TUNS) for the year 1991. File consists of the yearbook Artifacts:Technical University of Nova Scotia (TUNS) for the year 1992. File consists of the yearbook Artifacts:Technical University of Nova Scotia (TUNS) for the year 1993. File consists of the yearbook Artifacts:Technical University of Nova Scotia (TUNS) for the year 1994. File consists of the yearbook Artifacts:Technical University of Nova Scotia (TUNS) for the year 1995. File consists of the yearbook Artifacts:Technical University of Nova Scotia (TUNS) for the year 1996. File consists of the yearbook Artifacts:Technical University of Nova Scotia (TUNS) for the year 1997. File consists of the yearbook Artifacts:Technical University of Nova Scotia (TUNS) for the year 1998. Subseries contains three volumes of the Dalhousie University Chinese Students' Society Yearbook for the years 1962 to 1964. File consists of one volume of the Dalhousie University Chinese Students' Society Yearbook for the year 1962. File consists of one volume of the Dalhousie University Chinese Students' Society Yearbook for the year 1963. 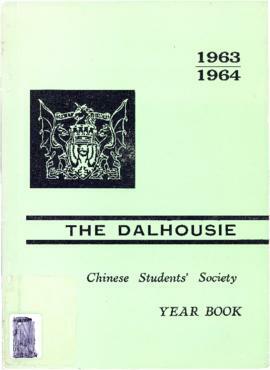 File consists of one volume of the Dalhousie University Chinese Students' Society Yearbook for the year 1964. File consists of one volume of the Dalhousie University Faculty of Law yearbook for the year 1985. File consists of one volume of the Dalhousie University Faculty of Law yearbook for the year 1986. File consists of one volume of the Dalhousie University Faculty of Law yearbook for the year 1987. File consists of one volume of the Dalhousie Physiotherapy: Dalhousie University School of Physiotherapy yearbook for the year 1982 . File consists of one volume of the Dalhousie Physiotherapy: Dalhousie University School of Physiotherapy yearbook for the year 1987 . File consists of one volume of the Dalhousie Physiotherapy: Dalhousie University School of Physiotherapy yearbook for the year 1991 . File consists of one volume of the Dalhousie Physiotherapy: Dalhousie University School of Physiotherapy yearbook for the year 2001. File consists of one volume of the Dalhousie Physiotherapy: Dalhousie University School of Physiotherapy yearbook for the year 2003. File consists of one volume of the Dalhousie Physiotherapy: Dalhousie University School of Physiotherapy yearbook for the year 2004. Subseries contains the Dalhousie University yearbooks for the College of Pharmacy: Morter & Pestle (1968-1969), and Modo Optimum (1973-1991,1995-1996, 1999, 2003, 2005-2007, 2009). File consists of one volume of the Dalhousie University Physiotherapy: Dalhousie University School of Physiotherapy yearbook for the year 1993 . File consists of one volume of the Dalhousie University Physiotherapy: Dalhousie University School of Physiotherapy yearbook for the year 1994 . File consists of one volume of the Dalhousie University Physiotherapy: Dalhousie University School of Physiotherapy yearbook for the year 1996 . File consists of one volume of the Dalhousie University Physiotherapy: Dalhousie University School of Physiotherapy yearbook for the year 2002. File consists of one volume of the Dalhousie University Physiotherapy: Dalhousie University School of Physiotherapy yearbook for the year 2007. File consists of one volume of the Dalhousie University Physiotherapy: Dalhousie University School of Physiotherapy yearbook for the year 2008. File consists of one volume of the Dalhousie University Physiotherapy: Dalhousie University School of Physiotherapy yearbook for the year 2009. Subseries contains yearbooks of the Dalhousie University School of Education: Spitballs and Chalkdust (1994); and Taking a Bite Out of Time (1995). The title ceased with the issue for1995 upon cessation of the program. File consists of one volume of the Dalhousie University School of Physiotherapy yearbook for the year 1992. File consists of one volume of the Dalhousie University School of Physiotherapy yearbook for the year 2011. 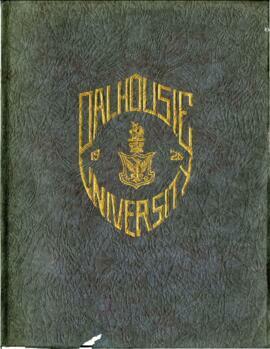 Subseries contains yearbooks published by students of Dalhousie University between 1927 and 1998. The bulk of the yearbooks, from 1929 onward, were printed under the title, Pharos, a reference to the destroyed lighthouse in ancient Alexandria. File consists of one volume of the Dalhousie University College of Pharmacy yearbook for the year 1973. File consists of one volume of the Dalhousie University College of Pharmacy yearbook for the year 1974. File consists of one volume of the Dalhousie University College of Pharmacy yearbook for the year 1975.